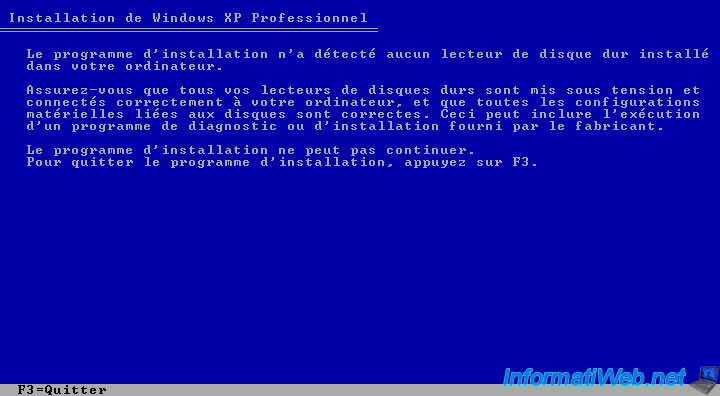 When you want to install Windows XP, the following message appears : "Setup did not find any hard disk drive installed in your computer". This error occurs when you try to install Windows XP on a SATA hard drive. Windows XP doesn't natively knowing SATA, he can not find the SATA hard disk plugged into your computer. To install Windows XP on a SATA hard drive, you will have to provide the link for your motherboard SATA driver. To do this, you'll have to download this driver on the website of the manufacturer of your motherboard and then provide the installer to Windows XP by a diskette or by including the driver in the Windows installation CD. For more information about installing Windows XP on a SATA hard disk, follow our tutorial : "Windows XP - Installing Windows XP on a SATA hard drive".